Maybe it’s because we are witnessing the end of the Space Shuttle era. Maybe it’s the run of documentaries about space and the origins of the universe that I’ve found myself watching lately. But I’ve got rather nostalgic about my time as a physicist. I’ve always had a fondness for quarks. Elementary particles have a number of properties like charge and spin. But quarks also come in flavours. Flavours? Yep … six of them in fact. Up and down, top and bottom, strange and charm. My favourite is the charm quark. It was so named because physicists were fascinated and pleased with the symmetry it brought to the sub-nuclear world. Charming. So I always thought it was funny that my first stay at the Max-Planck was also the start of my love affair with quark cheese (or topfen as it’s more commonly known in Germany). A very low-fat tangy fresh cow’s milk cheese, I like to think of it as the German version of ricotta. Truth is, it’s actually a dry cottage cheese. Great to use in baked cheese cakes and fabulous on dark rye bread, or topped with berries. I was totally charmed by it. I used to scour the Munich markets for fresh berries and learned the names of most fruit and vegetables within the first few days of my stay 🙂 I especially loved the tiny forest blueberries, or heidelbeeren. Sure, I also spent a great deal of time researching the city’s konditorei and bäckerei, tasting and documenting my thoughts on all manner of pastries and baked goods. But, every night, dessert would consist of slices of fresh pumpernickel topped with really fresh quark and sweet blue heidelbeeren. Sometimes just the quark and berries. BLISSSSSS. I remember standing at the bus stop at the end of a long day’s work. A guy came rushing out of the ESO building waving a large piece of paper at my supervisor and me. It was a print of the first photos taken by the Hubble telescope. Hot off the press! A historic moment and I was standing there waiting for a bus. The photos were totally garbage though thanks to issues with the telescope’s lens. I can empathise with the Hubble team’s plight. Photography is a dicey business. I’ve got a bitchin’ lens but photographing ice-cream is hard. Because ice-cream isn’t … it melts. Fast. So please forgive the photos … the ice-cream looks and tastes totally charming and heavenly! 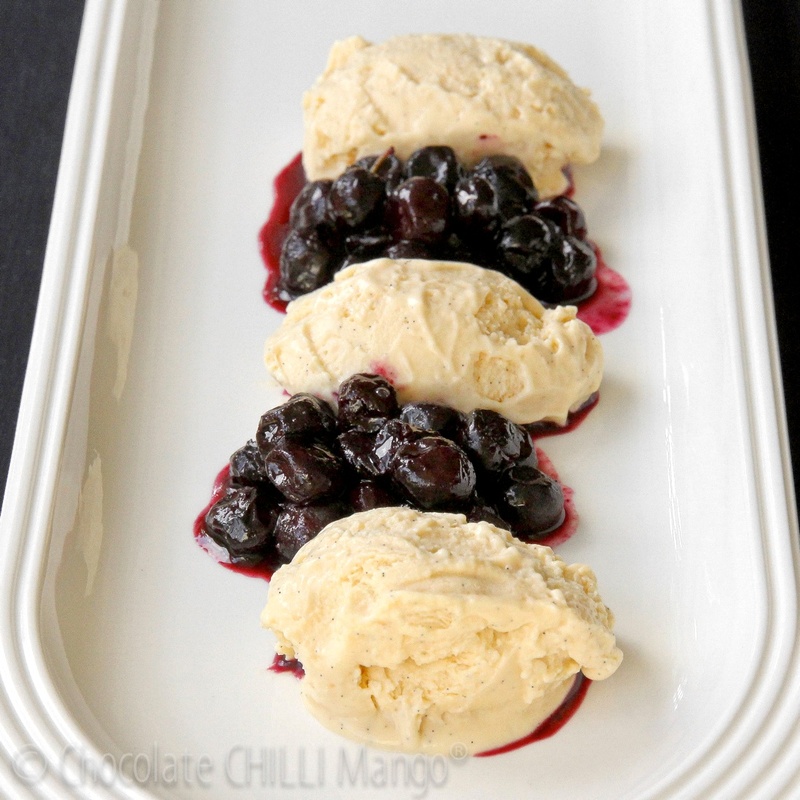 You can use fresh or frozen blueberries for this dessert with equally lovely results. The liqueur is totally optional. Go on, be charmed. 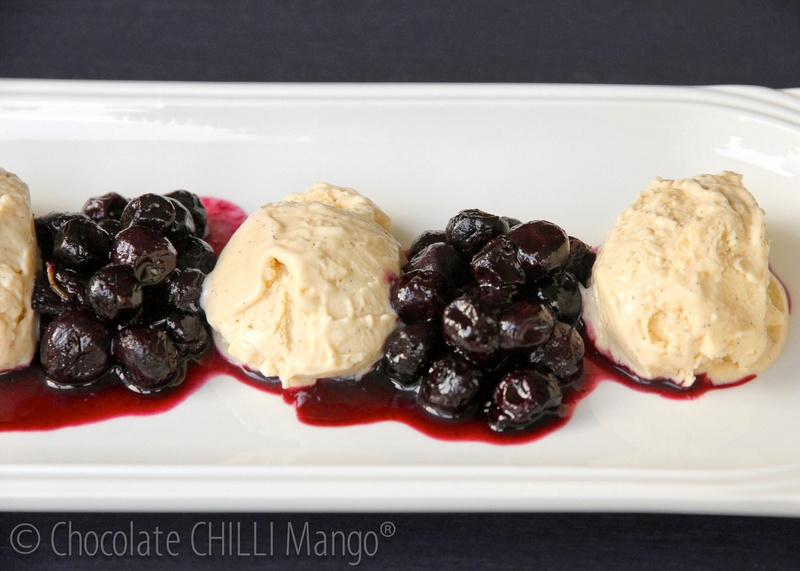 Make the ice-cream: Combine the sugar and water in a saucepan over a low-medium heat. Let the sugar dissolve and bring to the boil. Do not stir. Place the egg yolks in a bowl nearby. When the syrup has begun to boil watch it carefully. Beat the egg yolks until light and keep beating as you pour the syrup into the egg yolks in a thin and steady stream. Beat the yolk and syrup mixture until pale, tripled in volume, and it has the consistency to form a thick ribbon. Using a hand-held whisk, whisk together the cream and quark until light and smooth. Add the vanilla bean paste or seeds scraped from the vanilla beans. Fold in the egg yolk mixture until fully incorporated. Whisk the ice-cream mixture until light. This will help it retain a light texture as it freezes. Kind of like a “pre-freeze churn”. Scrape the ice-cream into a container. Cover and place in the freezer to set. It’s best made at least 6 hours ahead or the day before. It will keep for several days in the freezer. Prepare the blueberries: Place the blueberries and icing sugar into a saucepan over a low heat. Add the liqueur, if using. Warm through until the sugar melts and the berries soften slightly. 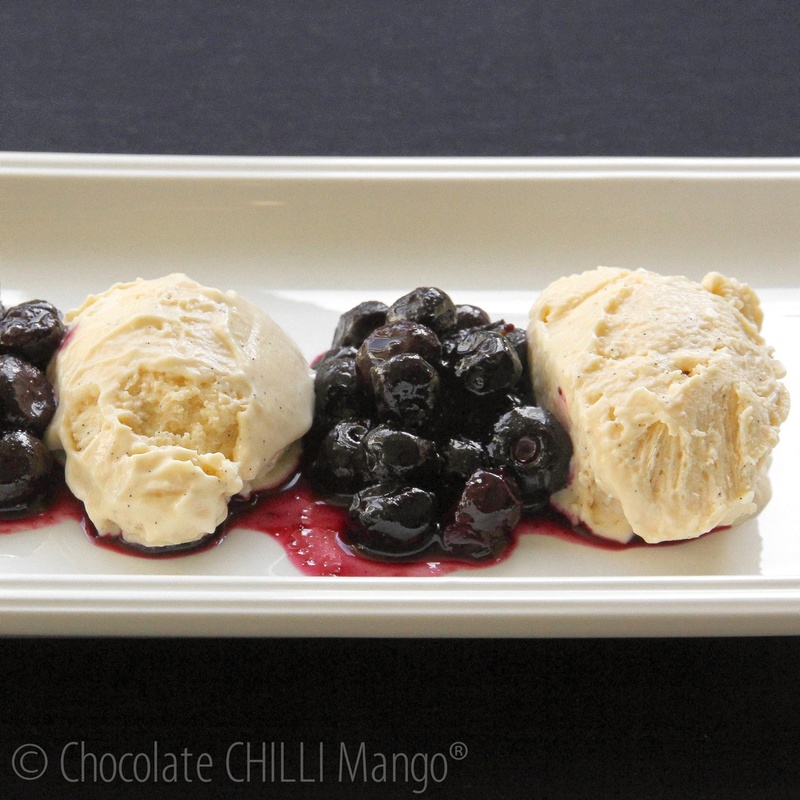 Serve warm or at room temperature with the gelato.